Honourable Hackman Owusu-Agyeman, Minister of Interior has said in London that the NPP government appreciated the efforts Ghanaian professionals living abroad were making towards the development of the country. 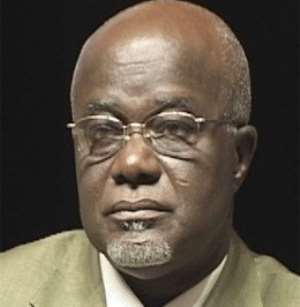 He noted with pride the immense contributions being made by prominent Ghanaians in managerial positions at major international organisations such as the UN, ECOWAS and Economic Commission of Africa (ECA) and pointed out that 'Ghanaians had shown that they could deliver when they were given the responsibility and opportunity'. Speaking at the 4th edition of the Ghana Professional Achievers (GPA) Awards in London, Hon. Owusu-Agyeman appealed to the large gathering to support efforts to compile a database of Ghanaian professionals at the country's Missions abroad to help in the development effort. The event is held annually to honour exceptional performers in various enterprises in a bid to further excellence in the Ghanaian and African communities. Dignitaries present at the function included Ms. Emelia Bartels, organiser of GPA awards, Dr. Samuel Nii Noi Ashong, Minister of State, Ministry of Finance and Economic Planning, Mr. Isaac Osei, Ghana's High Commissioner to the UK and his wife Mrs. Marian Osei, Mr. Kwabena Baah-Duodu, Deputy High Commissioner to the UK, Mr. Lee Jasper, Special Adviser on Racism to the Mayor of London, Mr. Fritz Andoh, Minister-Counsellor for Information of the Ghana High Commission, a cross-section of the Ghanaian community and friends of Ghana. On governance in the country, Honourable Owusu-Agyeman said the socio-economic conditions in the country were gradually improving and stressed that through bold efforts, government had finally managed to put the 'era of darkness' behind it. 'The days when people could not speak their minds freely are gone forever and we are now one people bound by a common vision to ensure that the rule of law prevails in our country', declared the Minister of Interior. He stated that inspite of numerous commendations received by the government for brokering peace in troubled spots in the sub-region, the NPP was not oblivious of its responsibilities as a government to its people and would continue to ensure peace and stability in Ghana. The Minister assured the gathering that government was delivering on its electoral promises to the good people of Ghana and explained that efforts to enfranchise Ghanaians in the diaspora for the 2004 elections could not be implemented for now. He attributed the protracted delays in certifying dual citizenship applications to the screening process adopted by the Ministry and indicated that the process was being streamlined to cut down on the delays. Honourable Hackman Owusu-Agyeman described the GPA awards as a laudable initiative and praised the organisers for creating the opportunity for the recognition of Ghanaian achievers across the spectrum to interact. On her part, Ms. Bartels paid glowing tribute to her sponsors whose untiring efforts had made the scheme the most loved event by the Ghanaian community in the UK. The highlight of the evening was a fashion show mounted by KRISWEAR, while Ghanaian singer, songwriter and musician Rhian Benson treated the large audience to some captivating songs from her rich repertoire.